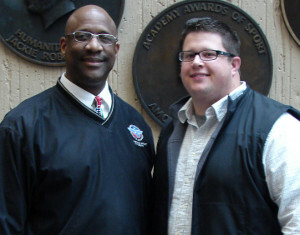 Academy graduate Brandon Bowling (right), who now works for CBS Sports Site MaxPreps, visited the campus and Academic Affairs Dean Dr. Fred Cromartie (left) during a business trip to Daphne. MaxPreps is an online high school sports information service that handles high school coverage. Tuesday night Bowling, who received a master’s degree in sports management in 2010, attended the Daphne High School basketball games to present the Trojans’ football team with an award for being one of the top high school teams in the country.